A methodology is proposed to improve the groundwater budget model by determining the past, present, and future recharge and discharge rates. The model is applied to an increasingly urbanized and industrialized region with drying tendencies: the Toluca Valley, Mexico. 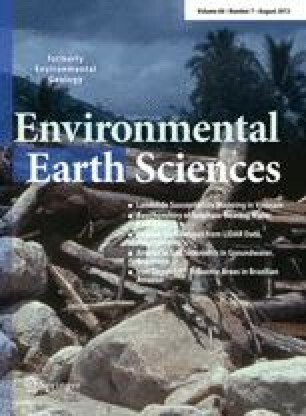 This study includes spatially variable recharge determined from the historical climate data, the climate change predictions, and the multiple parameters used in the Hydrologic Evaluation of Landfill Performance (HELP3) model. Using HELP3 a spatial discretization for the average recharge is obtained and estimated at 376 million cubic meters per year (Mm3/year). When considering climate change predictions, by 2050 the average scenario projects recharge to decrease by 15 Mm3/year (from 376 to 361 Mm3/year), and in a worst case scenario up to a maximum decrease of 88 Mm3/year (from 376 to 288 Mm3/year). Groundwater pumping has increased steadily since 1970 and is estimated at 495 Mm3/year for 2010. The current average deficit estimated for 2010 is 172 Mm3/year with average projections increasing to over 292 Mm3/year by 2050. This study of two of the most important components of the water cycle (recharge and discharge) clearly shows that the decreasing water availability in the Toluca basin is due mainly to groundwater pumping and that the current pumping rates are not sustainable. The current deficit can be considered problematic and projections based on expected water consumption and climate change reinforce the need for management of the water resources to be addressed. The authors would like to thank Miroslav Nastev for valuable contributions to the recharge model. We are also thankful to Sergio Murillo and the Comision Nacional del Agua for their logistical support on the field. We are grateful to the Ministère des Relations Internationales, CONACyT, the Autonomous University of the State of México (UAEM), NSERC (a discovery grant held by Richard Martel), AUCC/IDRC, and the Ministère d’Éducation du Québec for their financial support.